I am not even going to try to play catch-up with this blog, because that’s what got me in trouble this last year. So let’s fast-forward to the present where…well, actually I’m playing catch-up with my crochet projects. Go figure. I’m in that familiar place that so many yarncrafters (and other types of crafters) find themselves — in the middle of a big pile of unused yarn and unfinished projects. It started to stress me out, so I’m now going through and trying to finish all my unfinished projects. I’m doing well so far, and hope I can stay on track. Stop laughing. Last fall, in spite of the many projects I already had going at that time, I joined the Lion Brand Motif Afghan Crochet-a-long. I couldn’t resist — it was a motif project from Edie Eckman! I don’t know if I’ve mentioned her Beyond the Square book on this blog before, but I have linked to quite a few of the Motifs I’ve made from the book. It is awesome, and I highly recommend it. The book itself is very beautiful as well. This particular CAL was an afghan made from Motif 48. Using the CAL blog posts for guidance, I decided on a smaller afghan made of seven columns, with nine hexagons per column. The afghan is for our downstairs recliner couch, which is a merlot color with little flecks of various other colors. I got a ton of Lion Brand Wool-Ease yarn at JoAnn’s on discount, so I should have more than enough to finish the project. I found a red color that perfectly matches our couch, along with olive green, dark blue, and off-white, all of which match the aforementioned flecks of color in the couch. As promised, here is my post on the Lion Brand CAL. The pattern was the Moderne Jacket — details and purchase information can be found here. Before March, I’d never done a crochet-a-long, and it was great to read about everyone else’s experiences with the pattern and see all the different variations on the same garment. Originally I wasn’t going to participate because the yarn specified by the pattern would have cost about $130. That’s a bit out of my budget at the moment. Then, when I read the post on the Lion Brand blog about yarn substitution, I decided to go ahead with the project. Instead of the cashmere blend and the wool yarn, I used acrylic — Vanna’s Choice in Dusty Purple and Silver Grey, to be exact. The pattern uses two yarns held together, which was a new technique to me. The combination of these two yarns was probably a bit bulkier than intended — the example jacket looks more “meshy” — but I think my version looks great. As for the pattern, a lot of people had trouble with it because there were a number of inconsistencies. For example, working the pattern as written ended up with a staggered column effect, whereas the example jacket clearly showed the stitch columns aligned vertically. There was advice on both the Ravelry group and the Lion Brand blog on how to change this. 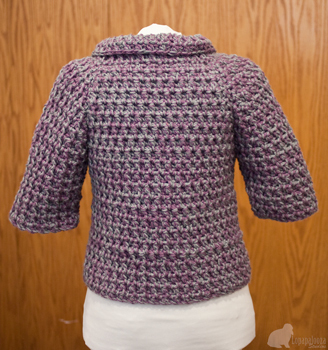 Although I worked the pattern as written for the back, I aligned the pattern on the front (for the most part). Another issue with the pattern was that the stitch pattern was meant for an odd number of stitches, but most of the front had rows with even numbers of stitches. No instructions were given on how to adapt for this. Also, at one point in the pattern, there was a missing row. I worked an extra row at this spot, with no issues. Others ran into the same problems, so it wasn’t just me misreading the pattern. I always try to rule out “user error” first. Apart from those issues, the project went very smoothly. The larger hook (N) combined with the thicker yarn made it work up quickly as well. When I made the gauge swatch, my row gauge was right on, but my stitch gauge was just a tiny bit too big. This was perfect, because the small size was just a wee bit too small (bust size 34″, I’m a 34″ or 35″) and the medium size was way too big (bust size 40″). 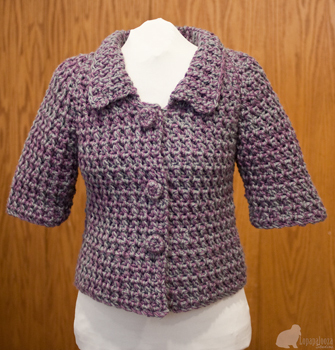 For the small size, I didn’t need to make the jacket longer but I did need it to be wider. I know the issues that can be caused by using the wrong gauge, but in this case, it worked very well. The jacket fits! Although the fabric is thick, I still used backstitch for the raglan seams for strength. It didn’t seem to add too much bulk to the seams. That’s enough writing. Here are the pictures of the finished piece. It fits a bit tighter on the dress form than on me, due to the pot belly on the form. Still, it looks good on me and on the form. Success! Next time: the rest of my freeform project.